How (Not) To Give After A Disaster – Beware the Comfort Zone! A man was stranded in the ocean. As he struggled to stay afloat, he knew he needed help, and fast. A large boat approached, and the captain yelled, “I’m here to help you!”. “What a relief!” thought the drowning man. The captain said, “Hold on, I have something to give you, it will help!” He emerged from the boat cabin carrying a large stone. “I’ve had this for a long time, but when I heard you needed help, I decided to donate it! It’s great quality, still has lots of use left, I’m so glad I’m able to help you!”. The captain tossed the rock overboard, took a picture, and sped away. As he approached the marina, he noticed another boat, ready to depart, but it was missing life jackets. “Sir!” one crew member called out. “We need money to buy life jackets to help people stranded at sea, can you help?” The captain shook his head. “Sorry”, he yelled back, “I already donated!”. As crazy as it may sound, a lot of donations to disaster zones make about as much sense. When a disaster happens, it becomes an excuse for people to do a little housecleaning, closet sorting, and suddenly they feel good about “donating to the poor victims”. Most natural disasters strike hard and fast, but in a very concentrated area. Just a few miles from the typhoon zone, life continues as normal. This means clothing stores still operate. Grocery stores and warehouses still function. I have a really hard time understanding how people think that a natural disaster completely disables an entire continent. We are just a few hours from where Typhoon Haiyan hit. We have stores that sell sorted clothing by the bale. 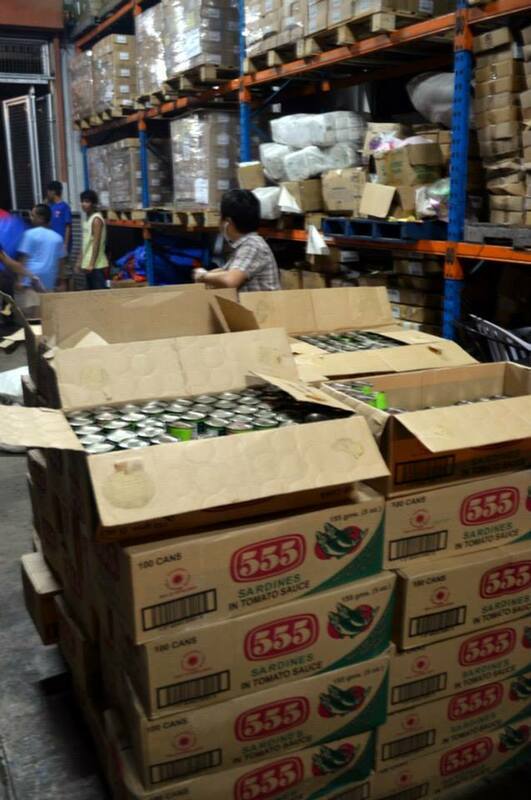 There are warehouses full of food that is already being packed by local volunteers and distributed. Heck, there are even stores that sell bulk stuffed animals (for resale mostly) to hand out to kids! The stuff is ALREADY HERE. It is ready to distribute in a very short time. Sending stuff from around the world is the most inefficient thing that can be done. I know there are some ministries/organizations that distribute food in bulk, and bring it in from outside, but it is done efficiently, pre-planned, pre-packed, and ready to go. Not to mention, they have the purchasing power to get better deals than we get buying at the local grocery store. Taking a grocery sack of canned goods or old, stained clothing, expired medications, and stuffed animals to the local drop off point is about as inefficient as it comes. Operation Blessing, a large relief organization here in the Philippines, already distributing food and relief goods. Don’t worry, sardines are not a “survival food”, they are actually loved here! So, you’ve gone through your closets and medicine cabinets, plopped all the junk that you should have given to Goodwill last year or thrown away in a bag, dropped it off, and now you can tweet to the world that you helped! Hooray! Now the bags must be sorted by hand, very time consuming, loaded on a container, and sent overseas on a slow boat. Oh, did I mention that most containers cost HUGE amounts of money to send? Even if transport ation is donated, fuel costs money, money that could be used to buy food, water, medicine, etc. locally. That doesn’t even take into account the environmental impact. Wow, all these “weird weather” phenomenons over the last several years, and yeah, I know there’s NO global warming (hmm…), but loading a boat full of stuff, that is already here, seems to be contributing to the very problem we’re trying to deal with the aftermath of. And, believe it or not, donations overrrun these areas, to the point of saturation and beyond. In past disasters, goods become a burden, as the locals are left to figure out what to do with the excess. After Bopha last year, recovered clothes were washed and line dried the following day. Don’t assume that everyone has lost all their possessions. And, keep in mind, the rest of the world does just fine without 50 pairs of shoes, wardrobes for every season, and color coordinated accessories. If clothing is needed, as mentioned above, it’s here! And, you get double the satisfaction of knowing that you are helping support the local economy, which is crucial in helping get life back to normal. 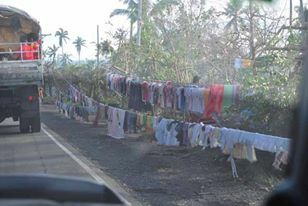 Clothing drying on a downed power line after Typhoon Bopha. Yes, more donations were needed, but so much was recovered and saved from the debris. 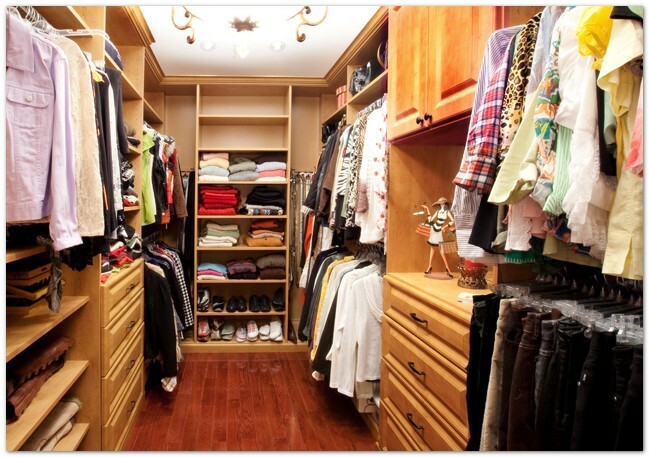 Not everyone strives for a closet like this! And it’s OK! Organizations plead over and over, “Please donate money!”, and yes, I realize a LOT of organizations take a huge percentage for “administrative costs”, so if that is what keeps you from giving cash, research your options. There are a lot of organizations that keep their administrative costs low. I also know that money is tight, sometimes $5 is a stretch. We’ve been there. But, as boring as it may be, it’s the best way to help. If you can’t give money, don’t “substitute” goods. It does not help. Prayer is powerful, pray for the victims. Have kids at a local school write letters or draw pictures for the victims, slip them in a manila envelope and send them to an organization to distribute. Little touches like that go further than you realize. Don’t contribute in a way that suits you, your needs, and fuels your “feel good” emotions. Doing it how you want to do it more often causes more harm than good. Please understand that I say all this out of love, not anger or some “know it all” attitude. We’ve unfortunately had the “pleasure” of seeing a couple major disasters firsthand now, and would just love for everyone with a heart to give to get the most bang for their buck. Not only for you, but for those you are helping. So, follow the advice of experienced groups, and if you want to help, please keep it simple. Give cash, not rocks.